I still have the pleasure of guiding our distinguished guest around Norway: the one and only Olga, a globe-trotting Bra (scroll down for an introduction and read about our visit to The Royal Castle, Vigeland Sculpture Park and the new Oslo Opera House!). Olga is eager to learn more about the Norwegian, our background and heritage and is always ask for more. So today we took her to The Maritime Museum to show the nations sailing and shipbuilding history from Viking times all the way to the modern cruise ship. Fram (left); Used by Fritjof Nansen as expedition leader when drifted across the Polar Sea, from the New Siberian Island to Spitsbergen in 1893-96, reaching 85º North. Roald Amundsen used the same boat to the Antarctic when he beat Scott to be the first on the South Pole on the 4th of December 1911. Gjøa (front): Roald Amundsen and his crew where the first to complete the Northwest Passage east and north of America. Materials of great scientific value where gathered 1903-06. Maud (right): Used by Amundsen to fulfil the comprehensive scientific north of Siberian coast in 1918-25 as well as the second ship completing the Northwest Passage in 1920. The closer the better for Olga you know! In the period of 800 – 1050 A.D., Norwegian, Swedish and Danish Vikings made extensive voyages for conquering and raiding as well as commercial purposes. Strongholds were established on the Atlantic islands, as well as Greenland, North America, England, Ireland, France and central Russia. The oldest Nordic boats built of planks from about 0 A.D. were discovered in Denmark. It took around 1000 years before this craft had developed into ocean-going rowing and sailing vessels, as examples by the large clinker-build Viking ships. Olga went home with us, satisfied and filled with impressions to the brim. She has her own blog too of course. Go visit and tell her if you like the way she explore and show off in Norway! I always have my lovely wife with me while showing Olga around. She’s a great photographer as you can see and a lovely supporter. Walking around with me and Olga in the museum, she found more interesting things to see so go visit her post and see this adventure through her eyes! AHOY Renny! Thanks for letting me steer the ship…it was almost as easy as driving Fracas’s car (which I was very very good at…even with one strap! )…it was FUN! But I thought the Polar Bear was kind of stuffy…he bearly said anything to me! The pleasure is on my side, indeed – Olga so great to have around you know and I just love to explore as well. You know I would love to meet you! Don’t wait too long and JazzBrunch on a Sunday at Grand would be fine. Vikings…I am very impressed! Love their boats and imagine them during their voyages. You say Norwegian, danish and Swedish and what about the Finnish at this time? Take care with the Bra I think the bear could catch it! Ha Ha! Tomorrow I will visit Olga and now I go to sleep because tomorrow I will do a walk and picnic with my 24 pupils in a botanic Park near the beach. Well, Finland as an entity did hardly exist before the 14th century. The ancestors of nowadays Finns consisted different tribes like Karelians, Tavastians and Finns. Don’t you worry, Olga can handle even a Polar Bear! Ha Ha! Have a good night sleep and a great time in the park tomorrow! Oh Maritime museums are always so much fun. Especially if they talk of a culture that has such a rich naval history ! Looks like you were the only visitors in the Museum ! Tell me, how are you related to the famous Amundsens ? Well, Norwegians are quite proud of our sailsmanship you know. Yea, there were actually a very few people around this morning. I’m not related. Amundsen is one of the most common last- or family name in Norway. What a great tour! Olga’s having a great time…and I bet you and Diane are too flashing a bra about town. Fun! I’m a bit sad though that you can’t eat ice cream cones in the museum (see sign by polar bear). We all had a great time and I just love to show guests around you know. Ice creams has to be eaten outdoors, but I’m not sure you would carve for it today: raining and around freezing. Thanks for a Sunday afternoon of fun and adventures. 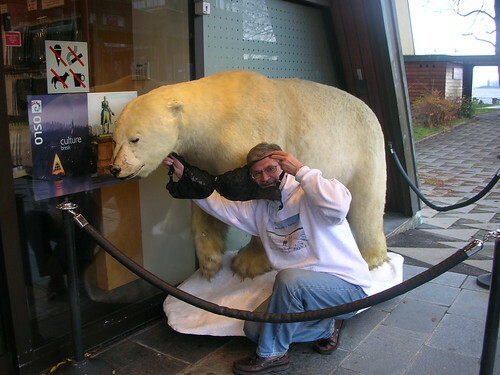 I too thought the Polar Bear was stuffy….something strange about a Polar Bear in Oslo on a day like today…and there was “something fishy” going on as well……. Its always great to have you by my side Darling! Well, the real Polar Bears are up at Svalbard and Greenland as well as Alaska you know. Huuuusssssshhhhh, don’t say anything about ‘fishy’, yet! I have posted now, so remember to link to your photographer!! Kiss kiss hug hug!! I’ve updated the post to give you the credit you deserve! I read and looked at all of Diane’s pictures first and then came here. 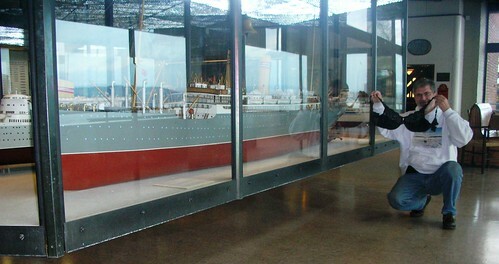 How fun for Olga to go to the Maritime Museum. I bet she was looking for an old sailor to go off with! I bet you two would enjoy touring by sea in Alaska. When we did that trip I fell in love with the frozen north. So, so beautiful. I hope to return there soon. olga is 1 big, well-travelled bra! hehehe. i envy olga. I assume Norway has a big sea culture and a rich naval history, given its location. I can’t stop laughing Renny… How entertaining… I could just imagine people going, look at that odd man! I was looking forward to the Viking ships! Oh well… I’ll have to go to Norway then. Looks like Olga is having fun! Hehehehehhe! I saw the Viking ships before but I dont know if that’s the museum that my father took me when it was my first time visiting Oslo. If I may say – Olga is very lucky to have you as a host Renny. You really do know how to entertain a visitor! Too funny Renny! I love it! Thanks for your Bday wishes to me as well! 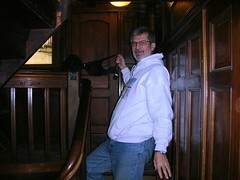 That seems like a very interesting museeum really, I’ve already been to Dianne’s blog and read her post. hahaha, what a great set of pictures. i love the shot of olga draped on the helm. she surely does get around and make lots of friends in the process judging by the last post too. So … how many sailors did Olga meet??? Hope she did not crash the boat as her attention was directed two ways. Olga was really lucky to have you as a tour guide ! Oh my gosh! I’m finally catching up on Olga and it looks like she’s having a fantastic time and seeing lots of great stuff!!!! Oh my goodness, RennyBA, you’ve stooped to a new low! I cannot imagine how you came up with this idea. Guess I’m off to meet Olga and her blog. Personally, I am a fan of Maidenform. You are having such a blast with that balck bra! Too funny! Didn’t fit the polar bear, eh?!! looks like you and Diane had a ball showing Olga her sea legs!! I finally posted about this on my blog! I have been up to my eyeballs in SMOOSHED BOOBIES!!! Olga has still got a one-track mind I see ……. oh well. 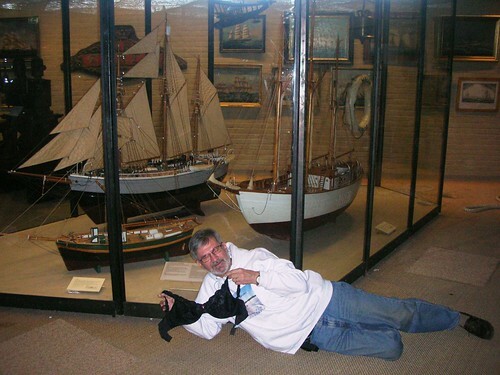 I love Maritime Museums BTW – I used to do a lot of sailing ……. It looks like you scared everyone off there is no one else there. What did you do? I’ll bet the Vikings loved Olga! I do hope that Olga is having a good time. From the pictures it looks like all of you are having the time of your lives. A Viking Maritime Museum!! it doesn’t get any more interesting! It’s fun to see all the places Olga gets to see, it even puts you down on the floor, lol! You made me laugh with this awesome pics LOL! It is nice to meet Olga! LOL *nodding*! You look great!!! It seems like you have rejuvenated (you should share the secret with us) :D! It looks like an interesting adventure. Seem like you all had fun. Without a shadow of doubt like Caro said – Olga is very lucky to have you as a host Renny. You really do know how to entertain a visitor! And can see the funny side of you already. 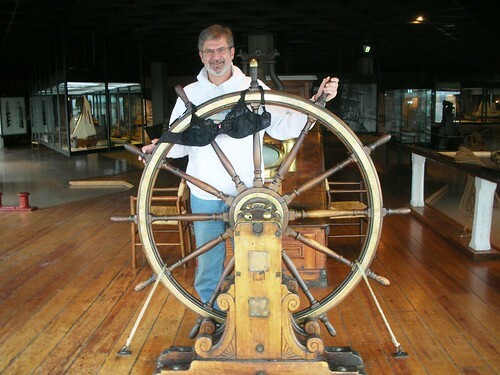 Great fun Renny – you’re braver than I would be, waving bras around in a museum. :) Did you have to get special permission? But it was a great tour, so thank you for taking us around with you! Looks like you all had a wonderful time ~ it’s such a cool place with all of those artifacts! Oh my Olga and sailors. What can I say? Oh my I won’t go down that avenue. You certainly are giving Olga a grand tour indeed. She will definitely have her “C’ legs to go along with her double D’s!! Oh my forgive me Renny I couldn’t resist. Olga just has a way of bringing out the crazies in all of us.